Homes that work for you! 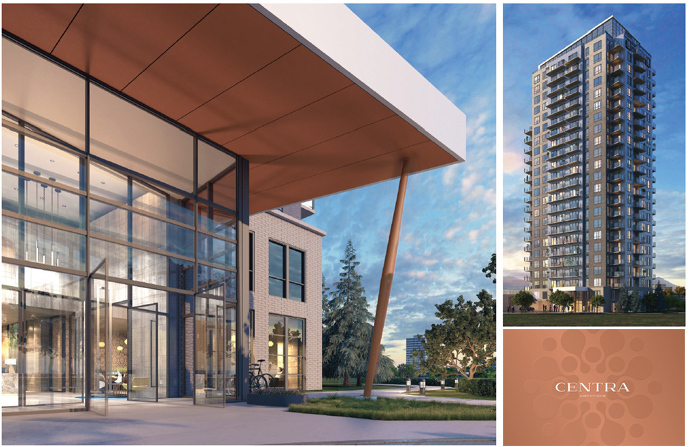 Introducing the new Surrey City Centre condos at Centra, an ultra-exclusive residence featuring only 167 homes for sale. Situated in a prime location close to transit, shopping, schools, major thoroughfares, dining and the best that the new downtown core has to offer, the Centra Surrey City Centre condos will also provide expansive views in every direction. The spacious interiors and functional floor plans will create new homes with real value, homes that will work for you in every way. 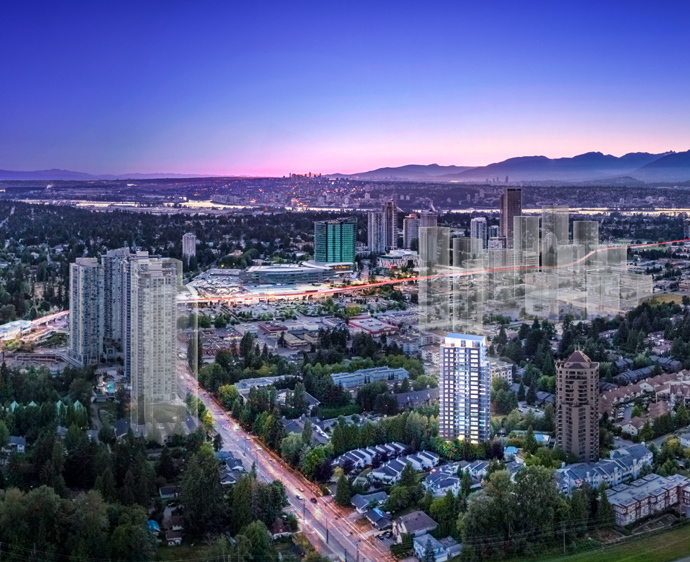 The presale Surrey Centra condos are brought to you by the Everest Group and will feature a 24 storey high-rise tower. The breakdown of the suites at the Centra Surrey high-rise include: 17 studios, 18 one bedroom, 18 one bed plus den, 63 two bedrooms, 17 two bedrooms plus den, 31 three bedrooms and 3 multi-level Centra townhomes. The presale Surrey Centra condo tower is nestled in a quiet residential neighborhood whilst being conveniently located near transit stations and the rest of the Surrey City Centre community. In addition, the presale Surrey Centra condos will be within walking distance to all the neighouring community amenities as well as those at home in the 16,000 square foot extensive indoor and outdoor amenity spaces that includes: coworking space/Everest Room, clubhouse, fitness centre and yoga studio, private theatre, outdoor podium, work stations, dog was station, parcel delivery room, underground parking, storage lockers and a convenient location just nine minutes walk away from the King George SkyTrain Station. What was once a suburban town centre is now a bustling and booming, walkable and affordable community that is focused on favourable transit options, business, culture and entertainment. The Surrey City Centre condos where the Centra Surrey condos are located are connected to the SkyTrain Line, future transit expansion routes, cycling/walking trails, parks, plazas, great views and much more. Surrey BC is the fasting growing city in the province and it is also the fastest growing and largest school district. The population of Surrey will double in the next decade and there are growing employment opportunities everywhere. With this increase, particularly in the tech sector, the expansion of SFU and the introduction of the new Kwantlen Polytechnic University campus, it makes the new Surrey Centra condos a great opportunity for both investors and end-users/homebuyers. You can visit www.centrasurrey.com for more details about the project. The high-end and exclusive homes at Centra Surrey City Centre will feature inspired interiors with lofty eight foot and eight inch ceiling heights in main living spaces, two exquisite colour schemes by Cristina Oberti Interior Design Group (light and dark) in addition to elegant wide plank laminate wood floors. Other interior features include expansive windows with roller shades and Blomberg front loading washer and dryer stacked in a space saving closet. The visionary bathrooms at the presale Centra Surrey condos are both sleek and elegant with finishes including stainless steel Grohe faucets and showerheads, polished chrome accessory fixtures, stunning Caesarstone counters with lavish cabinetry, contemporary soft close drawers/doors and sophisticated porcelain tiled floors. There is also exclusive floor to ceiling porcelain tiled walls featured in ensuite bathrooms, floor mounted dual flush toilet with soft close seat and spacious medicine cabinetry and shelving for great storage options. The cultivated kitchens at the new Surrey Centra presale condos includes contemporary finishes with Caesarstone counters, backsplash and waterfall edges, polished chrome Grohe fixtures embellished sleek cabinetry, under mount stainless steel sink and a great European stainless steel appliance package. The condo tower will also have a Virtual Concierge service for 24 hour assistance, monitored sprinklers and smoke detectors in every home, secure access and elevator lock-off control access to each floor, exclusive fob and key entry to parkade and the standard 2-5-10 National Home Warranty. Residents at the new Centra Surrey condos will be in for a huge surprise. The double height Everest Room will feature flexible co-work stations and meeting rooms, perfect for quiet study sessions or working from home. The oversized Centra Clubroom will feature a fully functioning entertainment kitchen, seating and private theatre, optimized to fit the needs of all types of occasions. There is a dedicated workshop room for minor home improvement projects. The Centra Surrey presale condo tower will also feature an in building pet wash station to keep your large and small pets clean, secured underground parking equipped with two electric vehicle charging outlets/stalls and multiple visitor bays. There is a specifically designed modern Parcel Delivery Room in addition to a fully equipped fitness centre perfect for all levels of fitness. The Centra Surrey City Centre condos also feature an outdoor urban space on level 2 podium that is ideal for gatherings and socializing. There is also a private yoga room that can also be transformed into a space for TRX workouts. URBAN ENERGY, SUBURBAN SERENITY. Located just steps from the city core within a quiet residential neighbourhood, Centra gives you everything you want in a Surrey City Centre Home. Expansive views, spacious floor plans, practical amenities and still within a 9 minute walk to the skytrain, Centra offers homes that works for you in every way. The preconstruction Surrey Centra condos are brought to you by the Everest Group of Companies (Developer), Atelier Pacific Architecture (Architect). Metrocan (Construction) Cristina Oberti (Interior Design) and Rennie (Sales & Marketing). Their marketing web site is located online at http://www.centrasurrey.com/.